Kirkstone Bathrooms asked us to produce a contemporary looking logo and website for their new business. We built a simple four page web presence that, along with their Facebook account, helps promote their business online. 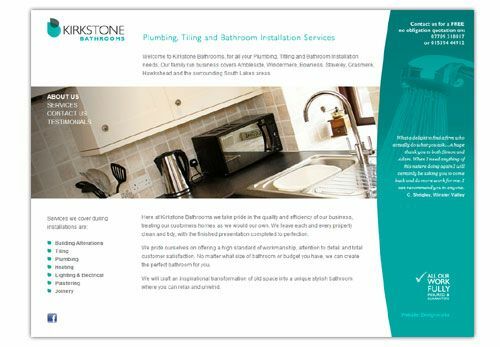 The site and their new logo, which is featured on their business cards and as a vehicle graphic, provides Kirkstone Bathrooms with an affordable professional look that will set them apart from the competition.